Known for its large ‘clouds’ of fluffy, smoke- like puffs of blooms, (actually billowy ‘hairs’ attached to the elongated spent flowers) the Smoke Bush is an upright, multi-stemmed deciduous shrub native from Southern Europe to China. Most familiar to us is the ‘Royal Purple’ Smoke Bush with its rich deep purple leaves and its spectacular blooms of hazy, smoky purplish pink! There are several new introductions and all will perform well in moist, moderately fertile soil – in full sun or part shade. ‘Grace’ Smoke Bush is a gem in the garden, it has iridescent spring foliage of green overlaid with red. Its large pink clouds of blooms in summer give way to brilliant fall colours that range from red to orange. ‘Young Lady’ Smoke Bush is a beauty that lives to bloom! Even as a small plant every terminal bud results in an airy pink bloom, with its fresh green foliage as a backdrop to the blooms, she is a real show off. 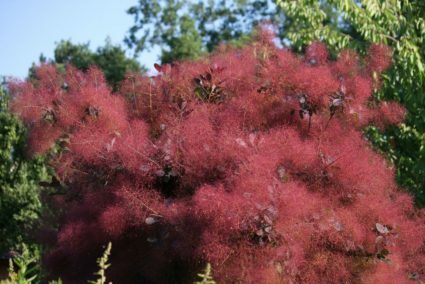 The Smoke Bush has been around for a very, very long time – fossils have been found in in Western Georgia that date to the early Pliocene epoch! Give it a place pf pride in your landscape and your very own Smoke Bush will be around a long time!